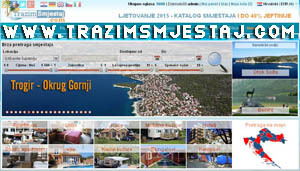 TrazimSmjestaj.com je turistički portal koji Vam omogućava da brzo i jednostavno pronađete smještaj na moru, planini ili bilo gdje drugo tokom cijele godine. Apartmani, sobe, vikendice, ville, pansioni, hoteli... sve na jednom mjestu. Welcome to Budin d.o.o. Travel Agency your best partner for accommodation in Croatia! 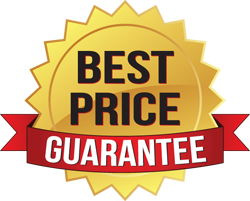 - Please send us any proof that you have found better price on our email: info@budin.hr we will check your claim and contact you within the next 24 hours. Self catering apartments in Croatia, rooms and all other types of private accommodation. Forget about high agency commissions and save up to 50% by arranging your Croatia accommodation directly with home rentals. 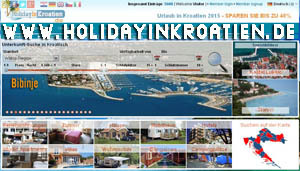 Search the database of more then 10000 vacation rentals in Croatia by categories or through the detailed accommodation search. You might cast off into the endless search for an accommodation in Croatia if you do not know the exact destination and a kind of rentals to begin with. Hotels, camps, pensions, rooms and apartments in Croatia are numerous and vary from cheap rentals to luxurious ones. Robinson tourism facilities are available at the coast and continent, as well. And yes, you’ve heard about magical landscapes of the Croatian shore and islands, and you do appreciate its natural and cultural inheritance. Yet, features of each, the smallest village, somehow differs, so, at first, you’ll have to distinguish if you want peaceful vacation at the edge of civilization, or you want a wild jamboree in some crowded tourist center. When you choose a destination of your dreams, it will be easier for you to pick a kind of accommodation that fits your abilities and needs. There are 673 hotels in Croatia, 39 camps and 48 nautical marinas. Private houses rental precedes 45% of total accommodation capacities. There are 58400 husbandries offering lodging in Croatia legally, which leads us to the number of 421000 of beds in apartments, rooms and holiday houses. Prices vary from destination to destination, depending also of amenities and the time of the year. 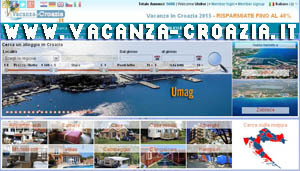 The most expensive accommodation in Croatia is in summer peak months, July and August. The most expensive region is Dubrovnik and its surroundings. It is also the region with the biggest number of five stars ***** hotels. Internet sites offering wide range catalogs of rentals, especially apartments in Croatia, are maybe the easiest way to find your holiday accommodation. Pictures from the screen seems to scream Pick me! Make sure you do your booking on time; that way you might get a discount. Amenities are diverse; traditional hospitality of Croatian people is rounded with modern technology achievements nowadays. Since tourism is expanding all over the country, tourist offer doesn’t just grow by the number of beds, but by amenities for a complete satisfaction of needs and wishes a guest might have. From year to year more and more private apartments and rooms are equipped with air conditioner, satellite TV, internet, microwave oven, dish washer and other. Usual things a foreigner have heard of Croatia are the past war and achievements of its sports. The war ended long enough to give Croatia the opportunity to remove its legacy and restore. Every other husbandry in Croatia uses internet, which makes 53% of its population. So, it is not a surprise that computers are available at rental apartments in Croatia, rooms and especially hotels. Cash machines and CPM is something you should check for, although the last mentioned is quite common even on distanced islands in the Adriatic. Competitive as they are, Croatians will always try to do their best at your service; from amenities and comfort to the kindness. At last, there is one more thing almost everybody knows about Croatia; it is famous of its brandy. Weather it is šljivovica, travarica, medica or other, often is served as a symbol of welcome and hospitality. Don’t miss to try this homemade autochthon brandy. We can help you find accommodation suited to your needs, provide advice on tenancy matters, plus lists of houses, flats, rooms and boarding options. Please contact us with your wishes and we will make you an offer of a Immemorial holiday! Croatia Vacation by Travel Agency Budin d.o.o. Donec a nunc nec est euismod congue. Duis id erat quis sem eleifend molestie. Proin at urna eu sem convallis elementum. Mauris non sem tellus, id imperdiet tellus. Aenean tristique vehicula laoreet. Pellentesque euismod auctor libero, in euismod eros. Vestibulum euismod vulputate consectetur. Suspendisse risus tortor, sagittis ac ante. tiam turpis arcu, tempus id mauris. uisque scelerisque interdum condimentum. Ut purus tellus, placerat eget mi. Aliquam pretium turpis, sed cursus urna fermentum non.